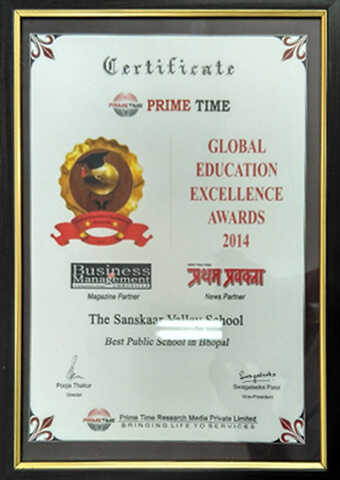 Education Excellence Award : Sanskaar Valley School was awarded with "Global Education Excellence Awards" in 2014. One of the India's leading market research, brand management and business consultancy company, Prime Time Research Media Private Limited organized the "Global Education Excellence Awards, 2014" to felicitate excellence, reputation and exemplary work in education sector. The event was held on 9th March, 2014 at Hotel Crowne Plaza Today, New Delhi. The event was covered by several esteemed print and electronic media houses. Global Education Excellence Awards, 2014 recognized around ninety (90) Achievers, Innovators and Leaders for demonstrating innovation, dedication, creativity and excellence in the education sector. The awards were the result of tireless efforts of Prime Time Research Media Private Limited spread over 3 months, which included nomination, comprehensive market research, opinion survey, web research, categorization of the nominations based on various parameters and finally choosing the winners though a panel of distinguished jury.